Hola! This is TravelBug's Norm Bizon checking in from South America. We arrived on a red-eye flight in Colombia’s capital city of Bogotá after a long layover in Houston and a flight delay. My body cried out for some sleep, but after a few cups of good Colombian coffee I was ready to go, especially since I had a bike waiting for me. 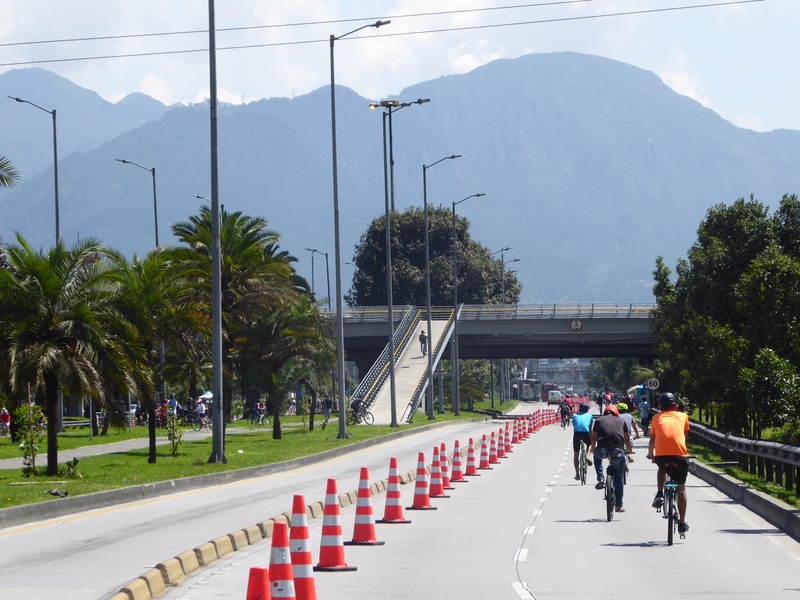 The timing was perfect to try out the Ciclovia, Bogotá's answer to getting the populace out to exercise. Rain or shine, every Sunday (and public holidays), the city partitions off 120 km of roadways throughout the city, opening up lanes and streets to cyclists, runners, walkers and skaters. An estimated 2 million or more city dwellers get out every weekend and take the opportunity to enjoy the temperate equatorial climate of Colombia's capital city. It claims to be the largest regular free recreational event in the world. It was refreshing to see families and kids out on the roads alongside the racers zipping by on their triathlon bikes with plenty of right of way for everyone. The route is lined with street vendors providing refreshments and entrepreneurs are ready with tools to fix your bike if you break down. Every few miles, we passed a stage set up and fitness instructors giving a free class to a crowd of hundreds jamming to disco or merengue music. Along with police and city crews, thousands of volunteers rise early to set up barricades and man intersections in time for the 7:00 start. The city streets return to normal at 2:00 pm, just in time for the inevitable afternoon rains that roll in off the Andes. We ended up downtown in the crowded city center when the barricades came down at 2:00. Not to worry, this bike friendly city has 350 km of permanent dedicated cycleways and before long we were back home safely. After a 50 km ride around the city, I had a great introduction to the energy and flavor of this modern, happening city. The next stop is Santa Marta on the Caribbean coast for a 4 day trek through the jungle to the Ciudad Perdida, - the “Lost City”.